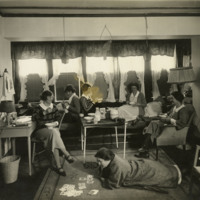 Photograph of six unidentified students in a dorm room. 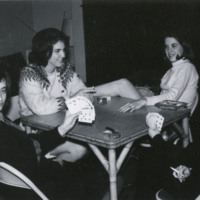 Several are eating and sipping tea while one student appears to be knitting and another is lying on the floor and looking at a deck of cards that is laid out on the floor. 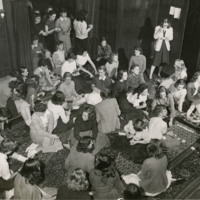 Photograph of students at what appears to be a social gathering of some sort. Many are seated while others are standing. Some are playing cards while others are sipping tea or reading.